General Motors has taken the wraps off the new Astra, despite the uncertainty surrounding the future of Opel and Vauxhall. The sixth-generation Astra is all-new and shares nothing with the current model; the platform is new and the engine line-up has been lifted from the Insignia and Corsa range. The first car to be launched at the Frankfurt motorshow in September will be the 5 door hatch which is expected to account for 60% of overall Astra sales. Joining the 5 door next year will be an estate. 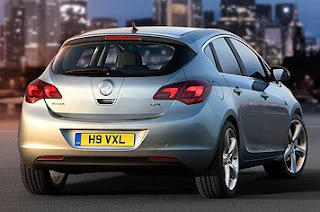 2011 will bring the 3 door Sport Hatch model with its coupé-like styling, 3dr VXR and a possible Astra based SUV. Like the current model, the coupe styling will be very different from the 5 door. Wider rear wings, a lower roofline and a different front-end design with larger intakes will set the 3 door apart and the blade design in the car’s flanks has been reversed to sit behind the front wings, in the style of the Insignia. 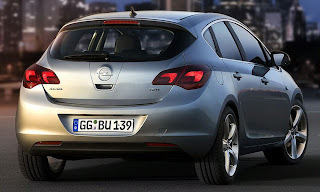 The new Astra is larger than the current model, mainly because of more stringent crash legislation. At 4,400mm long, it has grown by 110mm, but the wheelbase has also increased by 71mm to 2,685mm, which improves legroom for the occupants. Underneath is General Motors’ new Delta platform, launched earlier this year in the Chevrolet Cruze and due to form the basis for another four cars. The Astra does not have multi-link rear suspension, instead, there’s a reworked version of the Astra’s clever torsion beam set-up, originally engineered by Lotus. That means the new Astra will not be able to match the Ford Focus and Volkswagen Golf’s more sophisticated multi-link rear axles, but Vauxhall claims the new suspension takes the Astra’s ride comfort “into a different league”. 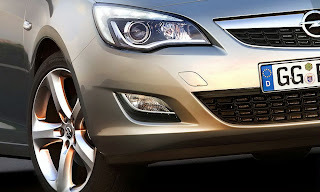 The car also gets wider front and rear tracks, which Vauxhall claims will help improve stability and agility. The Astra will be the first GM product to use a new 1.4 litre 4 cylinder turbocharged petrol engine, which replaces the current car’s 1.8 litre engine. The 1364cc engine has the same output as the 1.8, with 138bhp but has 170lb ft of torque, which will give it a diesel-like surge but with petrol engine responses. The other advantage is 10% better fuel consumption and CO2 emissions compared with the 1.8; that equates to around 44mpg and 160g/km. The rest of the petrol engine range will include a 99bhp 1.4 (not related to the new turbo unit) and a 177bhp turbocharged 1.6, that is shared with the Insignia. There will be four diesels: 1.3 litre with 94bhp, 1.7 with 108bhp and two 2.0 litre units, shared with the Insignia, with 128bhp and 157bhp. An Ecoflex model will go on sale next year, with a version of the current car’s 1.7-litre diesel. A GM source suggested that the car could produce less than 100g/km of CO2. The interior will be heavily influenced by the Insignia’s cabin, the Astra has a similar centre console, wrap-around fascia and instrument pod with four individual dials. Much of the switchgear on the centre console is from the Insignia, along with the climate control panel. 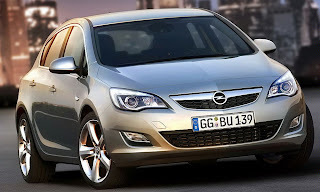 The Astra goes on sale in December. Pricing has yet to be confirmed but expect the entry-level 1.4 litre 5 door to undercut the entry-level 3 door Focus. These are the first official images of the new, British-built Vauxhall Astra, which will debut as a five-door hatchback at this September’s Frankfurt Show and will appear in UK showrooms at the end of the year. Marking the sixth generation of Astra in 30 years, the new car’s design team was led by Mark Adams, the British designer responsible for last year’s European Car of the Year-winning Vauxhall Insignia. With its strong, cab-forward silhouette, steeply-raked windscreen and sloping rear roofline, the new Astra makes ingenious use of many of the design features found in the Insignia, but in a fresh and innovative way. Also like the Insignia, it has spent over 600 hours in the wind tunnel, benefiting performance, economy and overall refinement. 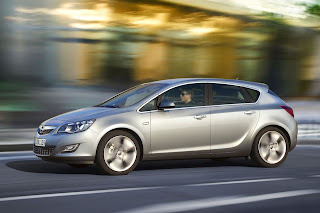 Underpinning the Astra’s rakish, 4.4 metre-length body, is an all-new chassis with a 71 millimetre-longer wheelbase, benefiting both passenger comfort and packaging. 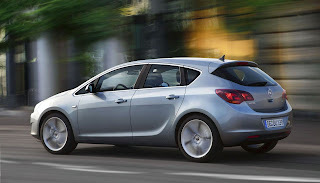 Wider tracks front and rear feature, as does a new rear axle design, which not only improves stability and agility, but takes the Astra’s ride comfort into a different league. 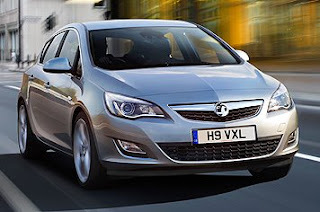 Enhancing the Astra’s dynamic performance still further is the option of Vauxhall’s clever FlexRide system, a rarity in this sector which offers drivers three unique damper settings – standard, sport and tour – while being fully adaptive to changes in driving style and cornering speed. Pictures of the new Astra’s interior will be released soon, but in the meantime expect similar strides in quality to those found in the Insignia, combined with big improvements in packaging, seat design and in-cabin storage. Mark Adams’ unique wrap-round dash treatment will also appear in the Astra, but with a different take on that found in the Insignia. Unique in this sector will be the Astra’s optional, latest generation AFL (Adaptive Forward Lighting), which features bi-xenon lighting that changes its intensity and reach to suit prevailing road conditions. A similar system was introduced on the Insignia, and is now recognised as one of the most advanced systems available. The highlight of the new Astra’s powertrain line-up is the introduction of an all-new, 140PS turbocharged 1.4-litre petrol unit, which builds on Vauxhall’s commitment to engine downsizing and reduced emissions/fuel consumption, while retaining the performance of a larger capacity vehicle. The 1.4T joins three further petrol engines, which range from 100PS to 180PS, and four diesel engines ranging from 95PS to 160PS. All engines are Euro 5 compliant.